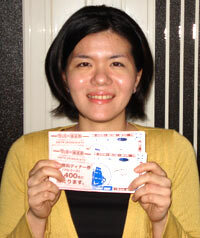 Sayaka Nakao won two ¥2,000 dinner tickets valid at any Sam’s Restaurant Group restaurant. She is a resident of Chatan Town. As Fexruary 22 is her birthday, she was double delighted for her good luck. “This is a very nice birthday present to me,” she said. She said her future plans include entering a nurse school in this April eventually becoming a nurse. Haresh Hingorani has lived in Okinawa for 10 years. 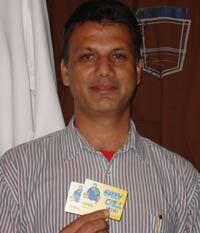 He is originally from Jaipul, India, which is a six-hour drive from New Delhi. But he says that “I love this place, and I am very happy to line on Okinawa with my family.” He is also the owner of a clothing store “Miracle” on gate 2 Street.